Thursday May 30 1907 It was a very unpleasant day. Will about home all day I did a little sewing and in afternoon prepared something to take up to Mrs Clarks birth-day party tonight which was a surprise to her. We had a very pleasant time I came home before it was too late. It rained some but we did not mind that. Friday May 31st 1907 I was busy all forenoon with the work. 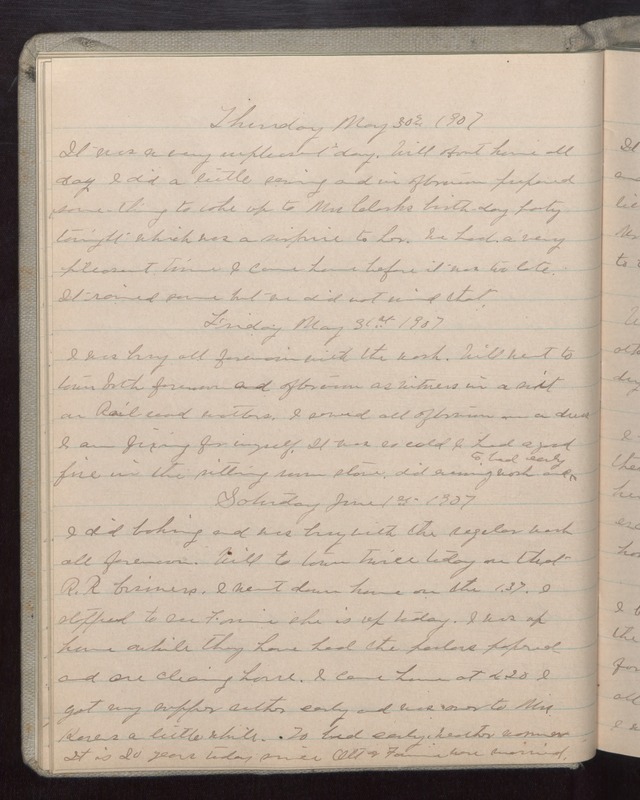 Will went to town both forenoon and afternoon as [illegible] in a [illegible] on Railroad matters. I sewed all afternoon on a dress I am fixing for myself. It was so cold I had a good fire in the sitting room stove. did evening work and to bed early Saturday June 1st 1907 I did baking and was busy with the regular work all forenoon. Will to town twice today on that R.R business. I went down home on the 1.37. I stopped to see Fannie she is up today. I was up home awhile they have had the parlors papered and are cleaning house. I came home at 4.20 I got my supper rather early and was over to Mrs [Kovers?] a little while. To bed early. Weather warmer It is 20 years today since Ott & Fannie were married.